Tariffs are being levied based on higher-priced Canadian lobster, they say, adding 'salt on the wound' of plunging U.S. lobster exports to Chinese markets. Maine lobster dealers say China is improperly inflating the market price of lobster to increase its punitive tariffs on U.S. live lobster imports. Chinese customs officials have been calculating the 25 percent tariff on U.S. lobsters based on the market value of higher-priced Canadian hard-shell lobsters, the dealers say. U.S. firm-shell lobsters usually cost $3 to $4 less per pound than Canadian hard-shells. 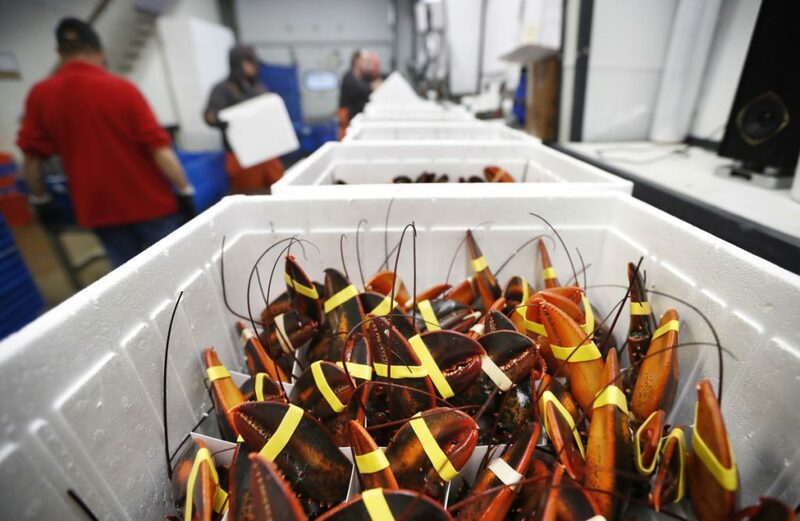 The tariff China is imposing on U.S. lobsters already gives Canadian lobster dealers a competitive advantage that Maine dealers have found almost impossible to overcome in the valuable lobster export market, dealers say. They fear the additional cost of a tariff based on the higher-priced Canadian lobster will scare away the few Chinese customers still willing to consider buying U.S. lobsters. Prices for lobster are based on the hardness of its shell, from processing grade, where the shell is like tissue paper, to hard shell, which doesn’t give when hand pressure is applied. Maine Coast sold 30,000 pounds of lobster to mainland China in July and August, Adams said. During those same two months in 2017, Maine Coast sold 10 times that much, or 300,000 pounds, to China, a decrease that Adams blamed completely on the higher price that Chinese customers have to pay on highly taxed U.S. lobsters. China’s decision to slap an extra 25 percent tax on live U.S. lobster imports in July as part of the escalating U.S.-China trade war hit the lobster dealers hard. The U.S. sold $4.2 million of live lobster to China in July, a decline of 64 percent from the two previous months and a two-year low for America’s most valuable fishery, according to newly released trade data. Although lobsters can be found as far south as North Carolina, the fishery is based in Maine, which supplies more than 84 percent of all U.S. lobsters. Last year, Maine fishermen landed more than 111 million pounds of lobster valued at about $434 million at the docks. By the time the dealers buy and resell it as a live or value-added lobster product, the fishery grows to a $1.4 billion industry. China had become the biggest overseas market for U.S. live lobster. It was on pace to double its lobster imports this year – year-to-date sales show the U.S. had sold $75.3 million of live lobster to China through June compared with $34.2 million in that same period in 2017 – before China levied its lobster tariff in July and turned off the U.S.-to-China lobster pipeline. Chinese buyers now must pay a 32 percent tax on all live lobsters from the U.S. – the 25 percent tariff that the Chinese enacted in response to a U.S. tariff placed on hundreds of Chinese imports, on top of a longstanding 7 percent lobster import tax. The tariff drove many Chinese lobster buyers to Canada, which lands the same species, but with a harder shell and no punitive tariff. There is little that Maine lobster dealers can do to close that price gap, said Stephanie Nadeau, one of the owners of the Lobster Co. of Arundel, which has shipped eight small orders to China since the tariff began. During that same two-month period in 2017, she would have shipped more than 100 orders to China, Nadeau said. Potentially making matters worse, the Trump administration said Monday that the U.S. will impose tariffs on $200 billion more in Chinese goods starting next week. China had yet to respond to the announcement, and it was unclear how the latest escalation in the trade war between the world’s two biggest economies might affect Maine’s lobster industry. Both Maine Coast and Lobster Co. continue to talk daily with their Chinese customers and are looking to expand into other Asian countries with growth potential, such as Vietnam, Malaysia and Hong Kong. Although Hong Kong is part of China, it maintains a special status as an autonomous trade partner, and thus does not have to levy the Chinese tariffs on U.S. goods. Adams said the Maine lobster industry is resilient, and has used hard times before to expand its global reach.